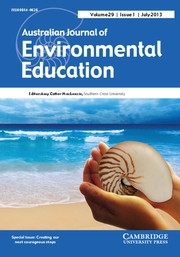 The journal of the Australian Association for Environmental Education is an internationally refereed journal which publishes papers and reports on all aspects of environmental education. It presents information and argument which stimulates debate about educational strategies that enhance the kinds of awareness, understanding and actions which will promote environmental and social justice. AJEE is the pre-eminent journal for the field in Australia and internationally. The journal is addressed to researchers and educators working in any educational or related settings where these matters are centrally or peripherally considered. AJEE is published twice a year and members receive significant savings as each individual article is $30 to purchase and the Journal is $132 in total. To receive copies of the AJEE, you must first become a member of the Australian Association of Environmental Education. Australian Journal of Environmental Education is a peer reviewed research journal publishing articles in the field of environmental education, broadly defined. It accepts original articles in all fields relevant to the instruction, theory, methods and practice of environmental education. Contributions are accepted in two sections: research Article section; and shorter scholarly opinion and discussion pieces, Communications and Thesis Synopsis section. The journal is published as three issues per volume per year. The journal is published in print and online. This journal is compliant with Open Access policies. Australian Journal of Environmental Education uses a double-blind review process. Articles initially are assigned to the Editor and screened as above. If these criteria are met, manuscripts are reviewed by at least two qualified referees with documented expertise. When reviews are returned, the Editor and allocated Associate Editor consider reviewers' comments, independently evaluates the manuscript, and makes an editorial decision to reject, request a revision with the stipulation of further peer review, request a revision subject to review by the Editors, or accept as is. Authors receive copies of (anonymous) referees' comments. Reviewers are also informed of the final disposition of the article.